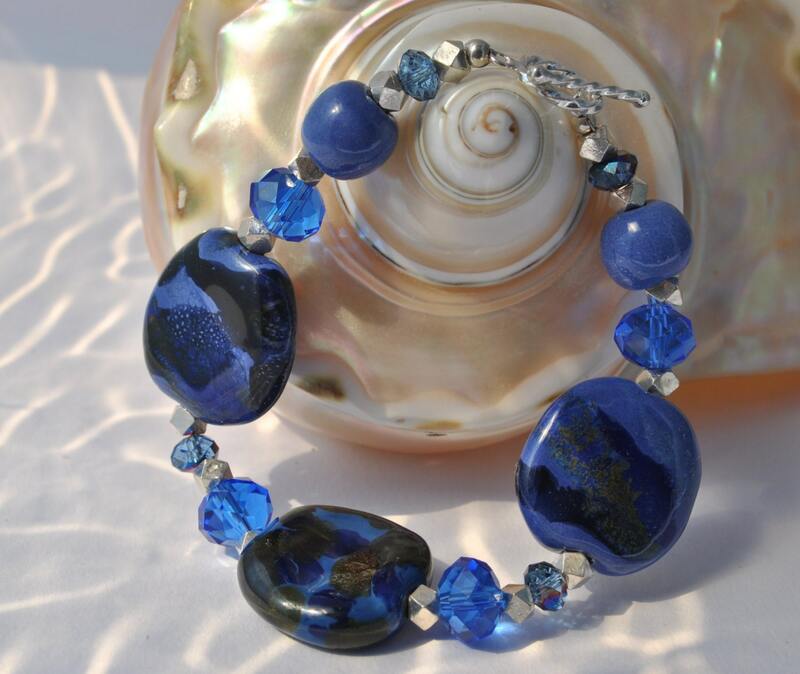 This is a gorgeous blue ceramic bracelet created with African Kazuri beads* , sterling silver beads, and crystals. It is completed with a sterling silver toggle clasp. 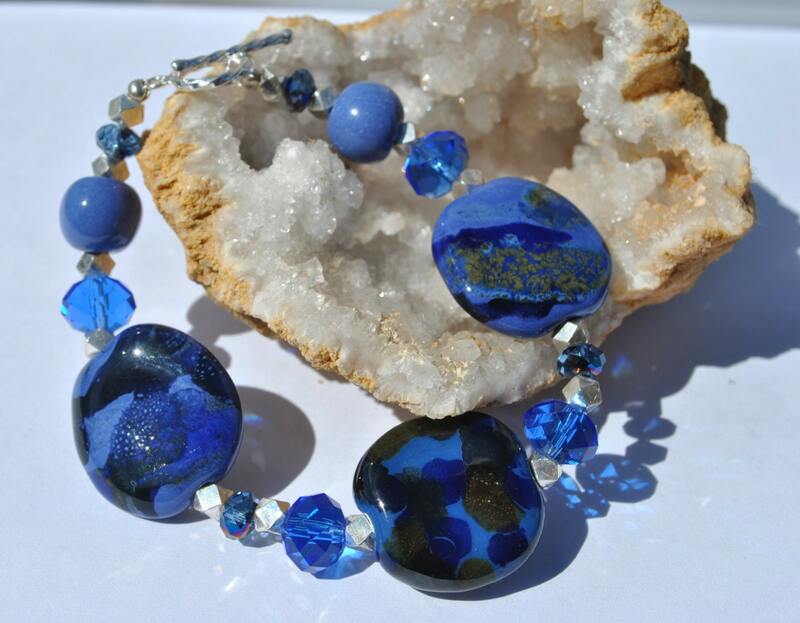 You will love the vibrant blues. *The Swahili word meaning small and beautiful describes these handmade ceramic beads created by disadvantaged African women. The clay for the beads comes from the mountains of Kenya and is then hand-shaped, polished, kiln fired, painted, and glazed into KAZURI beads. 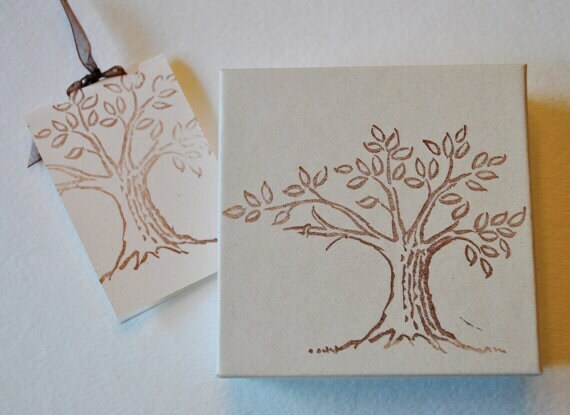 Your bracelet will be packaged in a cute stamped box with cottony insert. You can buy a bracelet with confidence if you know your correct wrist size. When you order a bracelet from me, I want it to fit you properly! 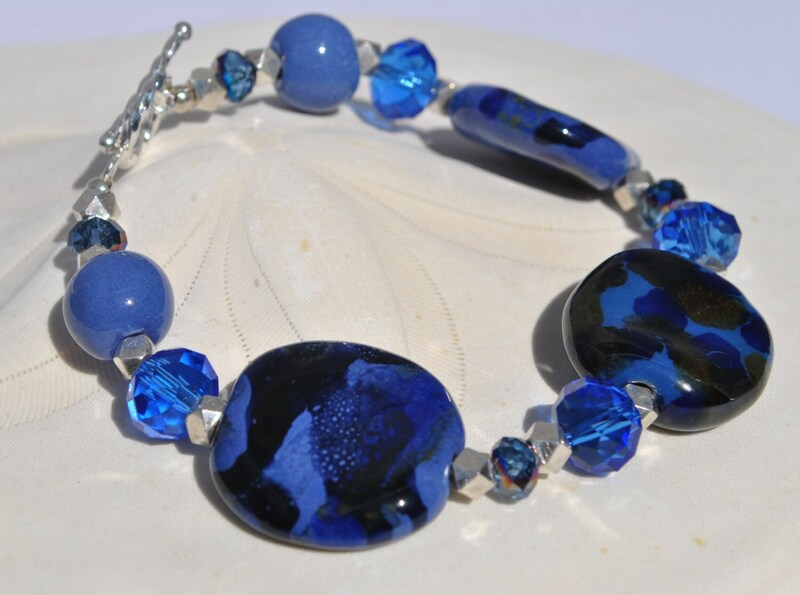 THE SIZE INDICATED IN THE LISTING IS THE INSIDE FIT OF THE BRACELET! These simple instructions tell you how to measure your wrist properly so you can be sure your bracelets will fit right. Using a flexible measuring tape*, Measure just above (towards elbow) the wrist bone; add 3/4" to 1" to that measurement to allow for movement and flexibility. This total measurement should be within the size range of the bracelet. Keep in mind that bracelet style affects fit. Some styles, depending on the type of clasp, provide extra space. In contrast, large gemstones or other adornments may reduce the room for your wrist. This is because the width of the beads themselves take up space on the inside circumference. Different size beads take up different amounts of space on the inner circumference. That makes the inside measurement smaller than the length when laid out flat. If this bracelet is a gift for an adult or young lady, and you don't know wrist size, we would consider 6 as petite, 6.25 as small, 6.5 as medium, 6.75 as large, and 7.0 as XLarge. *Tip: If you don't have a tape measure handy, use a strip of paper or thin string, and mark it where it overlaps on your wrist. Then lay the strip flat to measure up to the mark using any ruler.